From educational to just plain fun, these apps are sure to entertain your tech-curious tot (and maybe even teach them a thing or two). Cut the Rope: This is an extremely popular app. If your kids haven’t already asked for it, they will soon. Players try to get candy into the mouth of a cartoon character in this physics-oriented puzzle. The candy hangs by ropes, which the player can cut or manipulate. iPhone: 99 cents, iPad: $1.99, Free light version. Droid version is supposed to be coming soon. World of Goo: This is another physics-based puzzle. A construction game where players build structures by dropping and dragging balls of “goo", it’s popular for its sophisticated graphics, art and fun sound effects. The look is compared to Tim Burton films. Helicopter Taxi: A 3D helicopter that uses your phone’s camera, kids will love that the helicopter appears to be in the room with them, as well as the cute voices for pilots and passengers. Le Petit Dummy: This is purely silly. Kids can put cartoon mouths with different kinds of teeth on to a variety of pictures—historical-looking portraits, babies, cats—and make them say silly things. iPhone, iPad: Free. Can buy upgrades (such as different teeth) within the app. Droid Comic Viewer – Lets kids look at comics and manga onscreen. Cute Math: Tots are drawn to the cute part first: hatching baby chicks, penguins and apple trees with rainbows behind them. 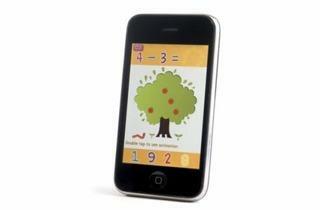 The charming graphics entice them to learn beginning addition and subtraction. 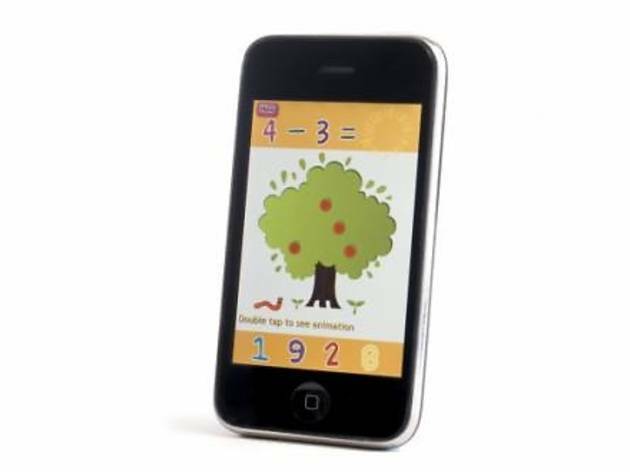 Games include touch-and-drag apple harvesting and parachuting number problems. It’s recommended for ages two–five, but older kids will get a kick out of it, too. Stack the States: Answer multiple choice questions about the states (such as capitals and bordering states) to earn a state to stack up and reach over a goal line. Stack the Countries is also available. iPhone: 99 cents, iPad: $1.99, Free light version. Alpha Betty’s ABCs: This app teaches very young kids the alphabet using fun illustrations of animals and wildlife. They also learn facts about the animals, learn about their body parts and play memory games. AstroApp: Space Shuttle Crew: This app from NASA was just released. As they wind down the space shuttle program, this app offers a history of all the missions and bios on the astronauts. Kids can also virtually “suit up” in an astronaut uniform using a picture of themselves. Star Walk 5 Stars Astronomy Guide: This seriously cool app lets budding astronomers point the iPhone or iPad at the sky to see what stars and constellations are in view. Gabor Nagy Graphing Calculator: Our editor-in-chief spent $120 for a graphing calculator for her kids before this app came out. It does just about everything the calculator can do, including graphing any x value and determining radians to degrees. It also has a few extras like taking a screen capture of the graph to forward via e-mail. Spin Art/Spin Art Studio: This is a modern version of a spin-art kit, minus the mess. Thirty-one canvases are available to paint on using a large color palette and different types of brushes. Kids can also spin the paper to create different designs or spin cut-out images such as bunnies and photos. When they're done, you can share their work via e-mail and Facebook. Color My Name: Allows you to create a personalized digital coloring book for kids using their names. If you want to go old school, you can also print out the pages so they can draw the traditional way.